Campania is the ‘shin’ of Italy’s boot, anchored by its capital, Naples. Its name comes from Campania felix, a Latin phrase roughly meaning ‘happy land’. 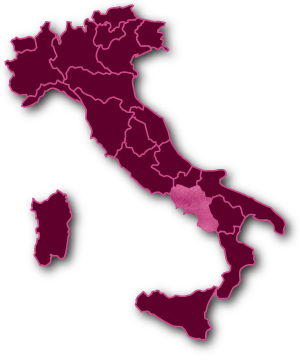 The region has strong historical links to wine and vine, dating back to the 12th century BC, and is one of Italy’s very oldest wine regions. The considerable influence of ancient empires, including the Greeks, Romans and Byzantines, means some of this area’s varieties have historical legends attached. The area is also famous for producing Falerno (Falernum), one of the most ancient wines in Italy. Also vital to Campania’s vineyards are the white-wine varieties Fiano and Greco, which are championed by the region’s most respected white wines, Fiano di Avellino and Greco di Tufo. Another light-skinned grape of interest here is Falanghina. The honeyed sweetness of Falanghina wines gained the variety praise from the ancient writer and philosopher Pliny the Elder, who is credited by some as being the creator of the phrase in vino veritas (there is truth in wine). Alongside the more-important varieties mentioned above are a host of little-known gems. These include Biancolella, the red-skinned Sciascinoso (locally called Olivella because of its olive-shaped grapes, and used in blends to bring a hint of color and acidity to wine) and Coda di Volpe vine, named for its resemblance to a fox’s tail due to the way the grapes grow in long bunches. Coda di Volpe also plays a role alongside Verdeca, Greco di Bianca and Falanghina in the Lacryma Christi del Vesuvio whites. Campania’s success owes much to the varied climates and terroirs that host around 100,000 acres (46,800ha) of vines. Viticulture is in its element thanks to an abundance of sunshine, dry hot summers, mild winters, a long growing season and volcanic soil (the latter ensured phylloxera was kept at bay). The coastal Mediterranean breezes blow in from the Tyrrhenian Sea and across the Apennine Mountains to temper the heat, encouraging a bright acidity in the fruit. These factors also contribute to the varied qualities of Campania wines. Despite being ensconced in tradition, today’s wine styles are fruit forward and youthful: the whites are known for their aromatic characters, often redolent of the local flora, while the reds (mainly from Aglianico) have big personalities which require a little ageing. Dynamic and innovative methods have helped improve the quality of Campania’s wines, specifically through better vineyard management, harvesting methods and cellar techniques.